Jack Redshaw with Blackpool boss Neil McDonald. Blackpool have signed Morecambe’s Jack Redshaw in a deal worth £180,000. As revealed in The Gazette last week, the 24-year-old has been in talks with the Seasiders after a failed bid of £150,000 two weeks ago. He’s signed a two-year deal at Blackpool and says Neil McDonald played a big part in his decision to sign. 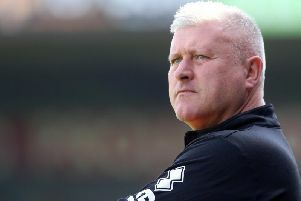 “I like the way the gaffer is trying to build the club and wants it moving in the right direction,” he said. “I think the time is right to step up into League One, I’m confident in my own ability and want to be successful with Blackpool. Redshaw quickly established himself as Morecambe’s prize asset after his move from Altrincham in January 2012. He rejected a move to Peterborough in August 2014 and went on to score 12 goals for the Shrimps last season. He added: “I was at Morecambe for three and a half years and I loved the place. Redshaw is expected to make his debut in tomorrow’s game against Lancaster.